Modern homes need to be multi-purpose. You want your living room to be able to capably perform as a place where you relax to watch a movie, and you also want it to be an area where your kids can play when the weather is too rough for them to play outdoors. You want to be able to entertain guests in the same room that you retreat to when you’re wanting to escape from the world and lose yourself in your latest Netflix binge. As a result of this need for multi-purpose living, the more a room can change, the better. We need our houses to be flexible, to keep pace with the relentless demands that modern life places upon them-- but the way we tend to organise our homes means that this isn’t always possible. The bathroom is always going to be the bathroom; it’s not like you can place a desk in there and call it your personal library. The kitchen is always going to be the kitchen; there’s no way that you could slide a single bed under the countertops and insist it’s a suitable bedroom for your kids. If you showed someone two rooms on the bottom floor of a house, completely unfurnished, and asked them to pick the living room out, they’d be able to do it. How? The TV sockets; the lines that run through the wall and allow for an aerial or satellite dish to be connected. It’s fair to say, then, that the living room is defined by the TV. However, what if you want to achieve that multi-purpose living room? It’s clear that the TV has got to go-- it’s the one thing that will continually mark out the room for its intended purpose. 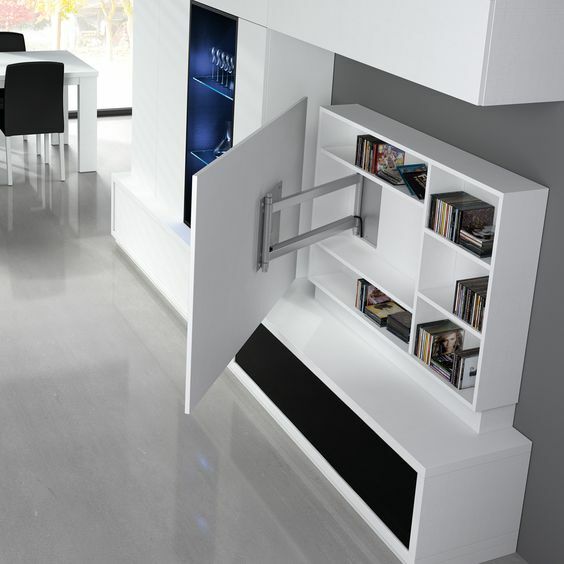 It’s at this point that TV units that hide TV screens and the fixtures and fittings below can make all the difference. With the click of a button, or the pull of a door, you can obscure your TV from view. The room is transformed; it’s now a shell, and you can do anything you want with it. You can throw a party if you want, or just spend 24 hours without being glued to a screen-- whatever you choose, your helpful Furniture In Fashion TV unit has given you the perfect way to achieve it.